Carol Ladas-Gaskin is a certified Hakomi therapist, teacher and trainer in Hakomi, a form of counseling and self study based on mindfulness, compassion and self study. She has been licensed in the State of Washington as a certified counselor and massage therapist with an ongoing counseling practice in the Seattle area since 1990. 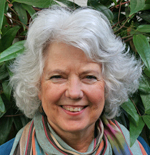 A founding member of the Hakomi Educational network and a clinical member of the U.S Association of Body Centered Psychotherapists and a member of the Hakomi Institute, she teaches ongoing Hakomi workshops in the Seattle area as part of the Seattle Hakomi Educational network. Her practice integrates Hakomi, Internal Family Systems and Focusing as well as the Progoff Journal and bodywork tailored to each client's needs. Carol has practiced and studied mindfulness with Jack Kornfield, Julie Wester, Ron Kurtz, founder of Hakomi and Donna Martin, senior Hakomi trainer as well as many others for over forty years. She has been a certified consultant/workshop instructor in the Progoff Intensive Journal, a mindfulness based journal practice since 1986. She developed and taught Life Skills classes at Brenneke School of Massage (now Cortiva) for over ten years. She also developed and taught the Integrative Practices program through Leadership Institute of Seattle and Brenneke School of Massage from 1995-2001. She is an award winning poet and the author of Instant Stress Relief. She is a co-presenter and co-author of Mindfulness and the Practice of Compassionate Presence, a seminar and handbook for health professionals through Professional Educational Seminars Incorporated (PESI). Her recent book including a 2 hour training DVD, co-authored with David Cole, is Mindfulness Centered Therapies, an integrative approach. Carol is a passionate teacher and counselor sharing with individuals in ways that promote a sense of vitality, understanding and interconnectedness. Individual sessions for individuals and couples are offered Monday through Thursday 9:00AM to 5:00 PM. PST. Direct insurance is not available. To contact, please click here or call 206-533-9601.